Let's go to Michelle Candaya for a live report. Michelle, thank you girl for staying on the scent of the great Brett Favre. From the vibe you're getting there, anything you may have seen or heard, do you think Brett is seriously contemplating coming back to play again in 2009? Michelle: Stu, I think he's doing exactly what he did last year... talking it over with people... assessing his opportunities, trying to make a smart decision... he's also got his shoulder to think about and whether he can withstand the rigors of an NFL season. If the warrior can't be a warrior, you know, it's not going to work. Stu: Mish, thank you for withstanding the rigors of staking out a mens' room in Murfreesboro, Mississippi. We're all hoping that Brett comes back and continues to prove his doubters wrong. Okay, got that off my chest. It's truly sad what ESPN has become with its constant, fawning coverage of Favre, who last I checked still pretty much sucked. It's another huge sporting night here in the Hub, with the Celtics and Bruins both playing in - say it together - pivotal playoff games; and the Red Sox playing the Angels later out on the West Coast. Recchi picks it off... kills time. 45 seconds. A little bit of pressure but B's clear it. 14 seconds... and the Bruins force a Game 7 after being down 3-1. Now over to the Celtics-Magic, Game 5 at the Garden. 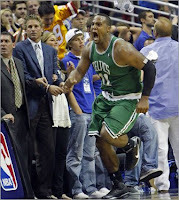 It's 55-46 Magic in the third, and the C's look pretty lethargic. Rondo just picked up his fourth foul on a charge, and Stephon Marbury (gulp) is manning the point. He's already launched and missed two straight shots. (Big Baby's mohawk is killing me. For me, he's been the most fun part of these playoffs, the way he's become such a valuable player almost overnight. His last-second, game-winning shot in Game 4 - and his reaction - will be remembered for a long time). Ray Allen just made a beautiful behind-the-back dribble and drive for a lay-up, the Celtics can't seem to stop Rashard Lewis. Celts are down 62-54 now with a minute left in the third quarter. (There just doesn't seem to be a buzz in the arena tonight). Celts can't seem to get closer than 5 points... last possession of the quarter... and they can't score. They're down by 8 heading into the fourth...I must say, I don't feel good about this one. More later after the Sox get going in Annyheim. It was uncanny regarding Manny. When I heard the news today that Manny Ramirez had been suspended for 50 games for violating MLB's steroid policy, I was stunned and I thought about how the guys they usually catch are the ones with the least gray matter up there. Clemens, for instance. Then I'm driving home, and my old college roommate calls me up and says in a phone message, "It's always the mental midgets... I'm telling you... track, baseball, football... just look for the stupidest guys who love looking at themselves in the mirror." HCG is one of dozens of substances prohibited under baseball's drug policy. Players can call a hotline to check on the legality of any substances, and they can obtain a therapeutic use exemption for any legitimate medical use of a banned substance. "This is failing more than a drug test," Conte said. "This is failing an IQ test. He can call an 800 number to ask about any product that he's taking. To think that a player who's making $45 million didn't do that, or have any agent or any of his numerous advisors check out what he said was a prescribed medication defies belief." Manny has a way of defying belief, doesn't he? We'll see what happens from here on out, but if it's proven that Manny was juicing during 2004 and 2007, we're now officially dragged into this mess. And that won't be fun. So I'm sure you've heard by now that the Yankees are having trouble filling some of the pricier premium seats in their new, taxpayer-funded mausoleum. Boo hoo. The blue backs of the empty seats actually go well with the whole new decor, Hank. You have to feel a little bit bad - a teensy weensy bit - for the true Yankee fans. Not only does their team stink, but check out the prices they're being asked to pay in the new, taxpayer-funded mausoleum. Quick update: Celtics and Bulls are engaged in yet another instant classic. First overtime, Celts up by 3 with 2:30 to go. Rondo again magnificent, and Perkins has been a beast. I'm starting to dislike Brad Miller's antics. The late, great Johnny Most would have a field day with this guy. In Cleveland, the Sox blew a 7-3 lead and were tied at 7 with the Indians at last check. Brad Penny is not getting it done. Actually, not everyone has won 11 games in a row. That would be the unique domain of the Boston Red Sox, who since starting out the season with only 2 wins in their first 8 games, have rattled off 11 straight victories since, with the wins coming in a wide variety of shapes and sizes. In a span of just four days, Jason Bay has taken two of the game's elite closers - Rivera of the Yanks and last night Kerry Wood of the Indians - deep late in ballgames to either tie or put his team ahead. During the streak, the one thing that has stood out to me is the amazing depth on this team. Dice-K has been on the DL for a few weeks, our top two shortstops have both been hurt, and our best power hitter - David Ortiz - doesn't have a dinger yet. No worries, though. We've got Justin Masterson and Michael Bowden down on the farm - and oh, yeah, Clay Buchholz too. Nick Green is a more than adequate fill-in at short. And the way Youk and Bay have been hitting, Papi can take his time finding that groove (but he better find it!). The Sox effectively stuck their tongues out at the Yankees Sunday night when they closed out the game with two Pawtucket call-ups, Bowden and Hunter Jones. After doing his job in the heat of the game's best rivalry, Bowden made the drive down 95 South again to Rhode Island to rejoin his minor league mates. The Yanks' brass, meanwhile, had to be wondering why they can't get guys like that. Sox go for an even dozen tonight in Cleveland. Weather has been iffy, but Boston.com is saying they'll have a window of time to get it in. Pitching thumbnails: Brad Penny (2-0, 7.80 ERA) vs. Anthony Reyes (1-0, 4.76). Does it get any better? Eighty degrees, a Friday night, Fenway buzzing, the Yankees in town, and a rousing comeback off one of the greatest closers the game has ever seen. Nice way to start this three-game series. 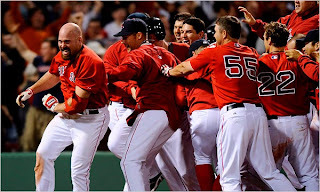 Jason Bay tied it at 4 in the ninth with a blast to dead-center off Mariano Rivera, and two innings later Kevin Youkilis sent everyone home happy with a homer to left that surely bounced off a few cars on the Landsdowne Street parking garage roof. Sox win 5-4 to draw first blood. Today's game is at 4:15 and should be another good one. Old Marlin pals Josh Beckett and A.J. Burnett will go at each other. Big Papi's already circulating word that if young Joba decides once again that Kevin Youkilis' head is part of the strike zone, he will be sorry. With warm temps expected here for the weekend, this series could be very, very interesting. Buckle up. Also, congrats to the Bruins for their first playoff series win in a decade. They certainly did it in style, overwhelming the Canadiens in a four-game whitewashing. Now it's the Celts' turn tonight. Good times here in the Hub right now. Good times. You know, it really all comes down to time. Work-wise, I had a first quarter from hell. Early mornings, late nights, weekends, and it still wasn't enough. I could have worked 24 hours a day for three months straight and there'd still be more to do. Now don't get me wrong - I've got a good work ethic, and I understand extra hours come with the territory when you're pulling down seven figures like I am. But when you start to dream about work every night, that's when you really need a vacation. So I took one. And a really long one at that. 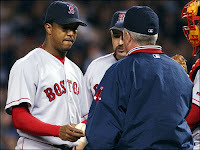 Between the quick post about Jim Rice finally getting his due and the short 2009 opening day recap, 85 days went by. Now I'm back from a real family vacation, and I'm raring to post away. I hope I haven't lost any of my three readers during the hiatus. Just know that it was part of an overall mind cleansing effort. So what to cover? Obviously lots going on in Boston pro sports right now. The Bruins are steamrolling their hated nemesis in round 1 of the playoffs, the injury-riddled Celtics are in a battle for their playoff lives with the upstart Bulls, the NFL draft is this weekend, and the Red Sox have shaken off their early-season doldrums and are starting to hit the ball around the yard. They dispatched with the Orioles pretty easily during a four-game sweep, and at this very moment, mere blocks from where my ample arse sits, they're holding a 10-1 lead in the seventh inning over the Twins. The game is in a rain delay, which is weird because it's not raining in the Back Bay. But I digress... the big problem early on was that the 1-2-3 hitters in the order - Ellsbury, Pedroia, and Big Papi - weren't doing much. That's changed a little over the past few days and now the wins are starting to pile up. The Sox are actually playing two games today to make up last night's rainout. Tim Wakefield has pitched another gem so far today (best thing about Wake - he can sit in the clubhouse for a two-hour rain delay and come right back in and throw that devilish knuckler). Tonight's game at Fenway has Francisco Liriano going against Brad Penny. 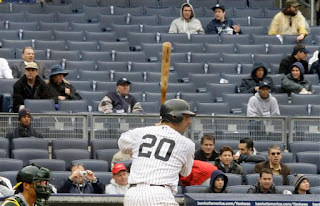 The new Yankee Stadium got a lot of ink over the past week or so because of the number of home runs that were hit to right field during the first series at the park against the Indians. A whopping 20 homers were hit in four games, and 14 of them went to right. All sorts of theories are flying around, and the only reason the Yanks are concerned is because more of those homers came off Indians' bats than their own. I was initially worried that the signings of CC Sabathia, A.J. Burnett and Mark Teixeira had shifted the balance of power in the AL East, and they still might - but so far, they've played pretty uninspiring ball. And consider this - even when A-Fraud comes back, their starting outfield is still Johnny "Pop-Gun Arm" Damon, Brett Gardner, and Nick Swisher. Not exactly Lynn, Rice and Evans. Some of the best early-season records belong to some surprise teams for sure. The Marlins, Blue Jays, Mariners and Padres are a combined 39-19 as I write this, while several of last year's playoff teams - including the Rays, Angels, champion Phillies, Mets and Brewers are a collective 26-39. Something's gotta give eventually. How bad are the Nationals? 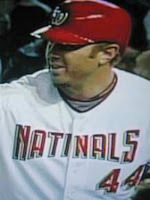 So bad that they actually wore uniforms in one game this year that had their team name misspelled as "Natinals", as displayed by slugger Adam Dunn above. That's bad. Really bad. If you want to pick up a good read, I highly recommend the Joe Torre/Tom Verducci book. Some good revelations in there, even if it is written out of spite. For Red Sox fans, there's also some good color on the epic 2004 ALCS comeback, and additional details on the Aaron Bleeping Boone game the year before. Yes, even after five-plus years and two world championships, my blood still boils at the mere mention of Grady Little's name. Doofus. My best fantasy baseball performers so far this year: Youk, Orlando Hudson (sell high! ), Bobby Abreu, Carlos Quentin, Joe Saunders and Andy Pettitte. Biggest disappointments: Brendan Webb, Lance Berkman, Chris Iannetta, Troy Tulowitzki, Jason Motte. What about yours?